JEG was in an awkward place. The plastics sales company was losing market share and recognition due to the slipping plastics recycling market. As the company is small, any change in sales was easy to detect, and the detection was not looking good. The company’s problem was focus. It had been relying on the growth of the recyclable plastics market. This caused a shift away from its primary focus: Creating high-quality color plastic for its customers. JEGPlastics.com, a website created in a limiting technology, created a new set of problems: Difficult to update, not responsive to all devices, and not reflective of the business and marketing strategy. In short, it was time for a refocus and site update. BlueCozmos stepped in and asked questions leading to a conclusion which changed the companies marketing focus. 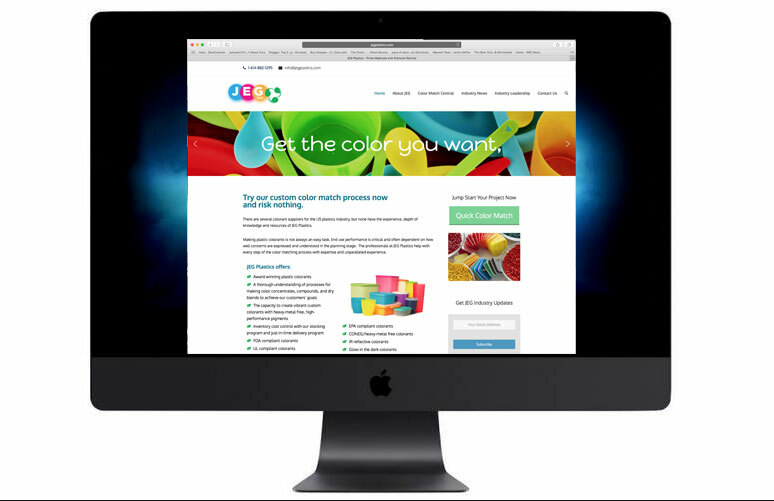 Without creating an overall visual overhaul, JEG Associates refocused its marketing by developing a website targeting potential customers who need rapid responses to problems in plastics color matching. BC created a Quick Color Match application which allows anyone to submit a photo, a color chip, or any representation of color for immediate matching. Key to JEGs success is getting out and staying in front of customers. BC expanded on this concept by developing an Industry News section which allows JEG to find, post and boost topical articles for its customers. JEG has seen a dramatic increase in the number of visitors to its site. Not only has the site traffic increased by a large percentage of first-time visitors, but repeat and referral traffic also increased significantly.